Tired of Deciding What to Cook Every Night? Three years ago I did something I wasn’t sure would work. It all began when my friend Caroline was telling me about one of those weight loss programs that comes with an exercise schedule and detailed meal plans. With her new, more slender figure Caroline was looking amazing. So I asked her how she had found the whole experience. While the motivation and commitment to exercise had really helped, the thing she loved the most were the meal plans. Each week she’d just print out the shopping list and buy what was on it. Or better yet, get her husband to do the shopping. Each night she’d walk into the kitchen, look at her notes and just start cooking. No agonizing over what to make. No having to ‘think’ at the end of a long day. 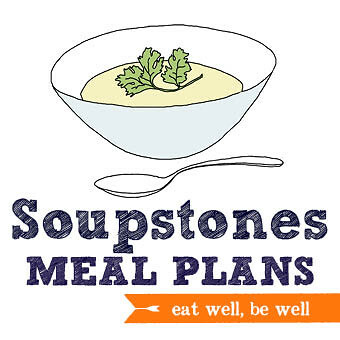 If you’re like my friend Caroline and could do with some meal planning help, then you might be an excellent candidate for Soupstones, my done-for-you meal planning service. “What I love most about it is that I don’t need to think of what’s for dinner. Thinking of a healthy meal for the family during the working week is tricky so I really appreciate the inspiration from your meal plans. The hard work is done”. I am completely addicted to this lemon and miso dressing at the moment. So much so that I’ve been making it by the bottle and keeping in the pantry ready to add a zesty freshness to salads, vegetables, fish – whatever I’m cooking really. It’s soo soo good! If you haven’t used miso paste before, it’s really worth experimenting with. Like soy sauce it adds those super tasty complex savoury (umami) flavours that takes food from OK to absolutely delicious. See here for more ideas for using your miso. 1. Combine miso and lemon juice in a jar or small bowl until smoothish. Whisk in olive oil. Taste and season if needed – a little more miso or lemon. 2. Rub fish with a little oil and pan fry or BBQ for about 3 minutes each side on a medium high heat, or until you’re happy with how it’s cooked. 3. 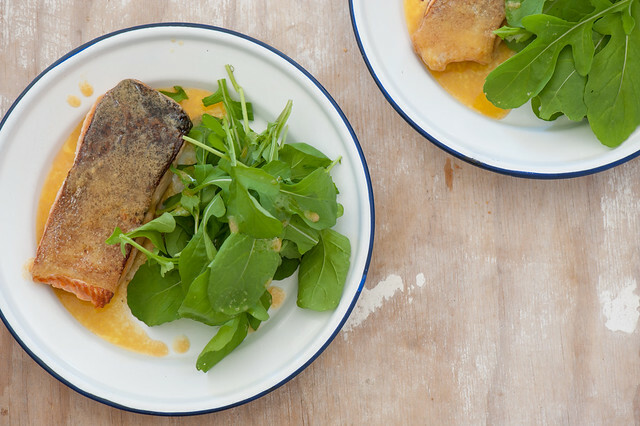 Divide salad and fish between two plates and drizzle over the lemony miso goodness. no miso – soy sauce is a good substitute. big batch of dressing – mix 1/2 cup lemon juice with 2 generous tablespoons white miso paste until smooth. Gradually mix in 1 cup extra virgin olive oil. Taste and adjust if needed. Store in a bottle in the pantry for a month or so (if it lasts that long!). vegetarian – toss the dressing onto grilled veggies – think eggplant (aubergine), zucchini (courgette) and peppers and serve with some goats cheese, feta, poached eggs or toasted almonds for extra protein. The dressing is also wonderful on cooked lentils. extra lemon kick – add the finely grated zest of your lemon. carb-lovers / more substantial – serve with steamed rice or cooked rice noodles. different fish – great with most fish so don’t feel the need to stick to salmon. 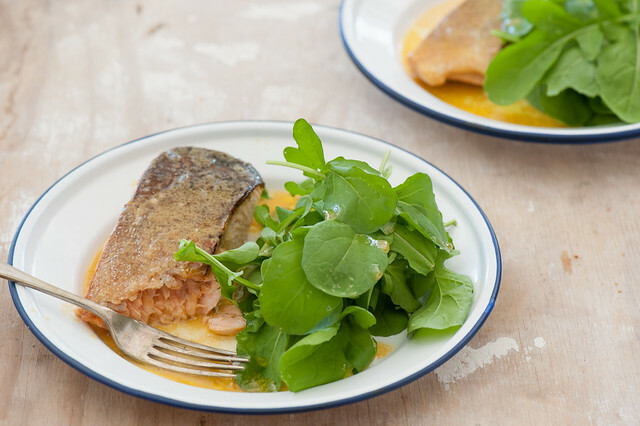 extra layer of flavour – marinate the fish in half the dressing for an hour or so before cooking. Use the remaining half to dress the salad. The only way to find out is to try it! ps. Have a question about the Meal Plans? Just email me jules@thestonesoup.com and I’ll be happy to help! Oh my, this post was a godsend. I was in dire need of a service like this, since I can never decide what to make for dinner and always end up ordering take out. Thank you, thank you, thank you! !